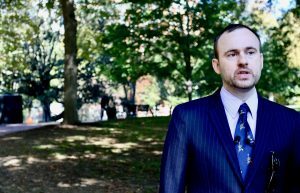 This past weekend, I attended a conference on the campus of Princeton University in New Jersey, and had to field numerous questions regarding whether Richmond is as racially oppressive as it is portrayed in the national media. I stood up for our city, and assured the conference attendees that both of my sons grew up in Richmond, attended RPS, and are doing just fine. I explained that I do not step outside of my door and get greeted with blatant racism on a daily basis. I got the feeling that they were listening, but remained mostly incredulous. 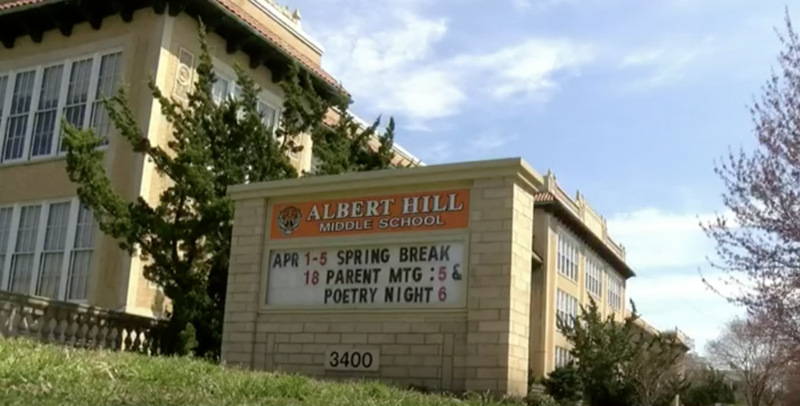 I had not yet heard about what happened at Albert Hill Middle School this past Thursday, and I am sure that the exchange between those young students and the RPD police officer who told them that when they turned 18 “their asses” would be his made my defense of this city much more difficult to believe. Growing up African American in deeply rural Caroline County, Virginia, I honestly cannot remember having one encounter with the police; in fact, I was barely aware of their existence. We had no security or resource officers in our schools; conflicts were largely (and quite effectively) handled by our school administrators. The mention of entering their offices literally struck fear in each of our hearts. I’m not perfect, and admittedly, I visited the principal’s office in elementary school several times. Once, while pursuing the entrepreneurial aspiration of making enough money to buy myself a bicycle, I got caught selling popping caps (a mild explosive) to kids in my fourth-grade class before school one morning. I was selling strips of five for a nickel, nickel bags of caps, and the kids were buying. Chaos ensued. My classmates went wild. Seemingly disembodied desk-chair legs and textbooks slammed and danced, in an effort to elicit the reward of the seductive single pop and puff of smoke that each tiny circle on the strips promised. I’m not sure who it was –my memory is blurred; I’m not even sure I knew then — but an adult entered the room and demanded to know who brought the caps. In a flash, every index finger in the room pointed at me. The speed with which those kids ratted me out was dizzying. The adult then told me to return the money, and those traitors hovered like vultures. From the plastic bag I held tightly, they took not only the money I felt I’d rightfully earned, but my lunch money, too. Then came the perp walk to the office. I sat on a wooden bench outside my principal’s office for what seemed like hours: nervous, but also self-righteously determined to defend my case. My nine-year-old mind had not processed the seriousness, disruptiveness, and potential danger of my actions. I had a product my classmates were willing to pay for, and they bought it. Supply and demand. I did not see the problem. Besides, they had taken the caps and all of my money; I was left high and dry. It didn’t seem fair. My principal, a gentle but firm, flame-haired white woman (whom we knew was kind, but also meant business), called me into her office. I slowly walked in, tears streaming, anger brewing. She explained to me why what I had done was wrong — told me that selling things, especially explosives, in school was against the rules. She emphasized just how much valuable time the disturbance I’d caused had cost the teacher and the other students that morning. She then called my mom to come to pick me up for the day which, honestly, was punishment enough. No referrals. No suspensions. No permanent records. No police. Kind redirection. It worked. I never sold another thing at school again. I understood that the principal cared enough to take time to explain why I was in trouble, and I begrudgingly agreed that calling my mother was an appropriate penalty. There was no permanent record of the encounter, but I remembered the lesson forever. As a child, I had the good fortune of having authority figures who cared more about nurturing our spirits as young people than about criminalizing our behavior. Men and women, white and black, who taught us how to self-regulate, to use reason as a means of determining appropriate actions, and who modeled the moral behavior that helped us to later determine the difference between right and wrong. We were disciplined with love; we thrived. 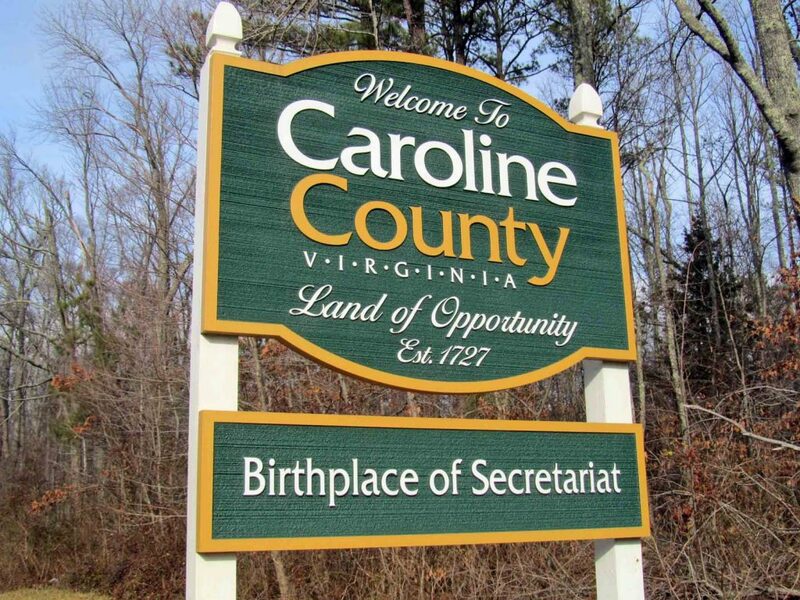 It appears as I’ve grown up, and now have sons of my own, that my experiences in Caroline County were as much an aberration as they were idyllic. Though I have worked hard as a teacher myself to carry on the tradition of loving discipline, and to fiercely protect my students from the harsh, punitive society we live in (especially for black, brown, and disabled children), it appears that many public school systems do not subscribe to this philosophy. In fact, while researching and writing this piece, I encountered case after case of young children in Virginia, particularly of African American descent, being referred to the criminal justice system for issues that could have been effectively handled within the school, even within the classroom, without involving law enforcement. 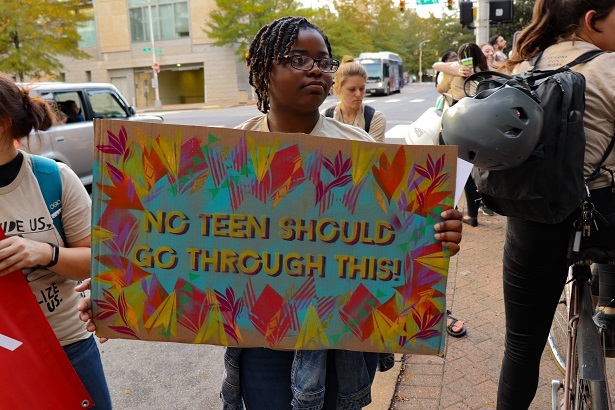 In one case, an 11-year-old autistic African American boy in Lynchburg received two misdemeanor disorderly conduct charges: the first for throwing a tantrum, the second for reacting in fear when a police officer grabbed him around the chest. U.S. Department of Education data shows that in most states black, Latino and special-needs (disabled) students get referred to police and courts disproportionately, and a report released by the Legal Aid Justice Center found huge disparities in many school districts between the percentage of black students who received short-term suspensions, and the percentage of white students, as well as the percentage of students with disabilities suspended, compared to those without. It also determined that the vast majority of suspended students are punished for behavioral offenses, like having a cell phone, minor insubordination, and disrespect. 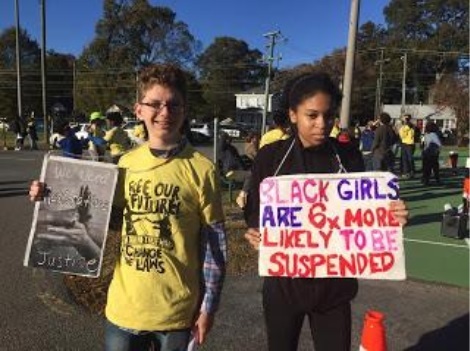 I personally spent four years teaching for Henrico County Public Schools, one of the school systems where disparities were found, and witnessed many instances where black children were disciplined for minor infractions more often than their white counterparts. I witnessed black children being called to the office much more frequently for dress code violations — short skirts and sagging pants somehow seemed to be more offensive on black bodies than on any others. I once witnessed a white female student of mine walk out during an assembly, right past a teacher monitor, and a black male promptly get stopped when attempting the same thing. When I confronted the teacher about it, she stared right through me as though she couldn’t hear my inquiry. In fact, the only student who became violent with me while I was teaching there was a white male, who threw a 10-pound literature book at me in front of the entire class because I insisted he stop sleeping. I cried. To my knowledge, that student was never asked to take responsibility for his actions. I recognize that I am tying together the problem of school suspensions with issues of encounters with police and the criminal justice system, but as researchers Kerrin Wolf and Aaron Kupchik report in their 2016 study, School Suspensions and Adverse Experiences in Adulthood, “being suspended increases the likelihood that a student will experience criminal victimization, criminal involvement, and incarceration, years later, as adults.” It appears that the two are inextricably connected. It is because of this that, as a now-30-plus-year full-time Richmond resident, I find what happened with the Richmond City Police officer and the young students of Albert Hill Middle School so extremely dangerous. The officer told the children to wait until they turned 18, at which point, he suggested, their “asses” would be his — as though one day, he could own their bodies. This communicates that their bodies are not, and never will be, their own — and that they will never be protected by those like him. That idea itself can cause long-term psychic trauma. 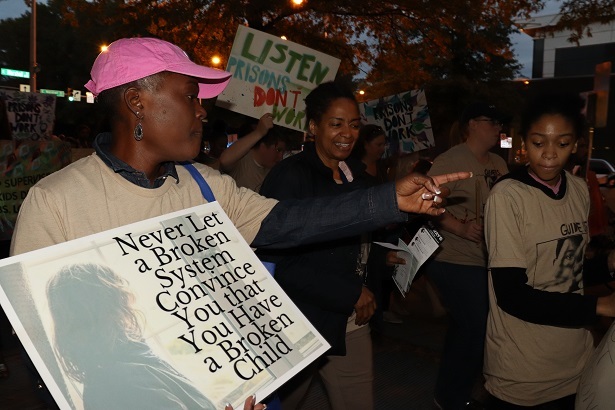 There are many dedicated people out there working to love our kids, and they are making inroads toward disrupting the school-to-prison pipeline — their work should be commended. 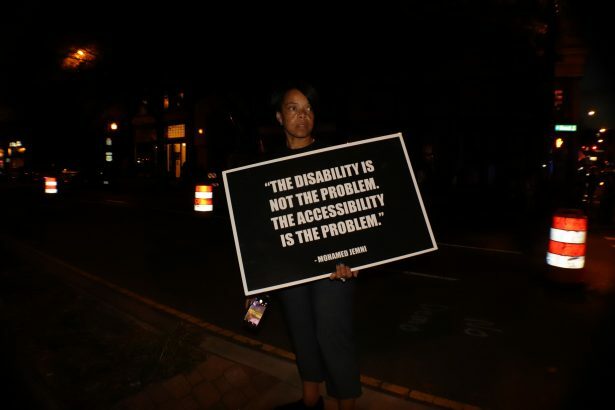 But not until our country is ready to recognize that bias against black, brown, and disabled bodies is virulent and real will we see all children as worthy of protection and love. Until then, even changed policies will fail. My hope for my children, for all of our children, is that we get close to what I remember of those days at Ladysmith Elementary school, where we ALL knew we were valuable, and that the adults in our lives could be trusted to guide and protect us, even during our worst moments. Shame on that Richmond police officer. 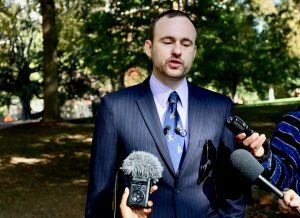 There is no doubt that what he said to those children was, as Gibson states, “unacceptable and disappointing.” But let’s also recognize that he represents a larger, more insidious culture of devaluing that which we should all so deeply love. Note: Op-Eds are contributions from guest writers and do not reflect RVA Magazine editorial policy. 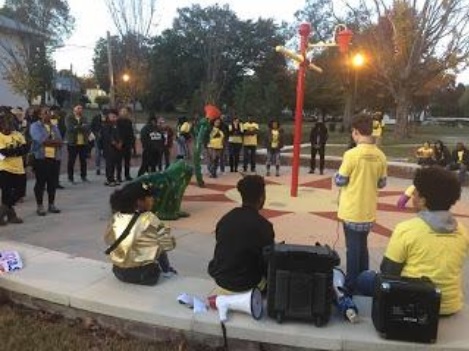 This weekend, I attended Art 180, Performing Statistics, and RISE for Youth’s joint event, the Juvenile Justice Parade. 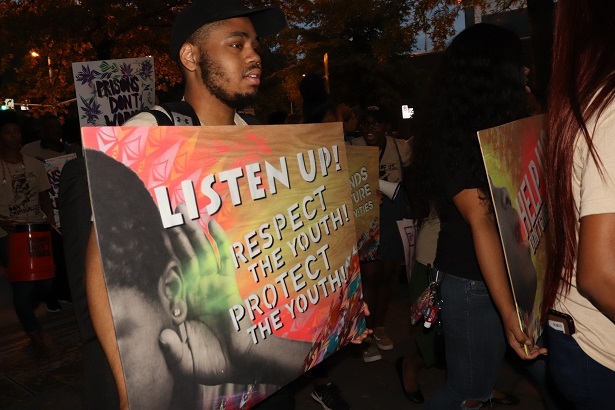 It was organized by black and brown youth, all of whom have faced personal discrimination and many of whom have been personally sent through the school-to-prison-pipeline. 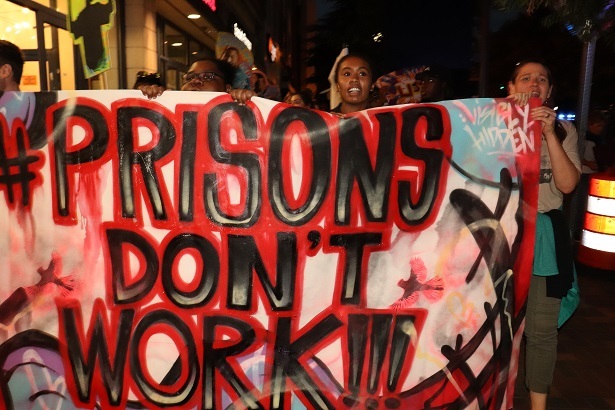 Chants spanned from “Fund education, not incarceration, invest in us, invest in us,” to as simple as, “Prisons don’t work!” As we marched, we each were holding at least one piece of artwork from formerly incarcerated youth, organized by Art 180, and we took their art to the streets with a moving march, literally and figuratively. 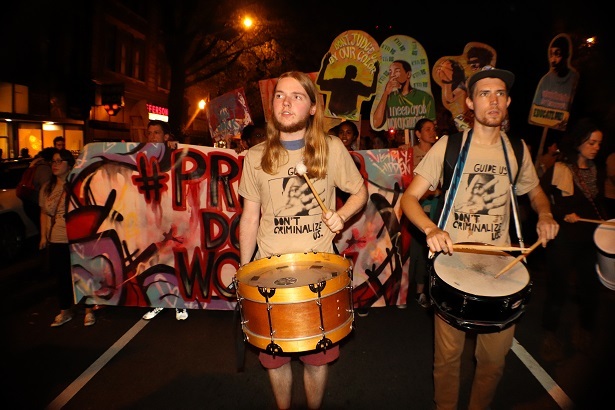 We started at a community center and ended at a park, marching through backstreets and backstreets only. 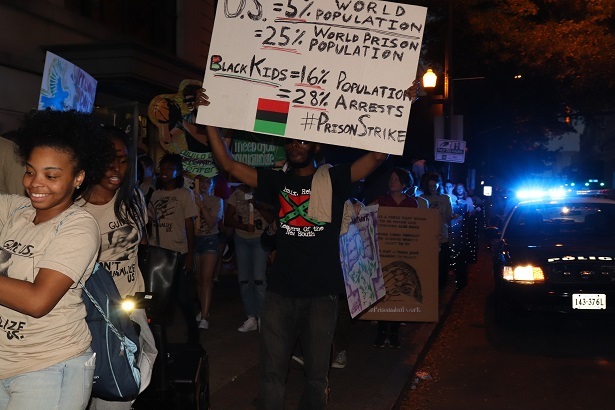 I felt weird about being guided by the police car and chanting these things in the first person, but I had to set my awkwardness aside to focus on the bigger picture– the mobilization and the movement. At the beginning and end we heard speeches (one by my friend Stephanie), songs, raps, poetry, and freestyle dances, all of which went to support a bigger cause. In the park there was an open mic after all of the scheduled speakers had gone, and I shared my poem, “Do Nothing,” with a feeling of hope. Based on the title of this post, you may think my point will be that showing up is all you have to do, or that it is the simplest of actions, but neither are correct. To truly make a difference, you not only have to show up, you have to show up again, and again, and again, for whatever cause matters to you. This seems like a lot, but it really isn’t. The simplest of actions, I will argue, is even simpler than attending an event. What can you do that will help you show up, get involved, and most importantly, spread your voice? Talking, listening, discussing. Its as simple as that. No matter who you are or what you do, you cannot change the world alone. But with a group, you can. It recently came to my attention that we all, introverts and extroverts alike, need groups to thrive in activism, even if they’re just three other people. So, a whole year ago, I made an after-school club called TCLU (or the ACLU of Tuckahoe Middle School) and went through the bi-weekly craziness for a year (kudos to Ms McNew and Hayes). 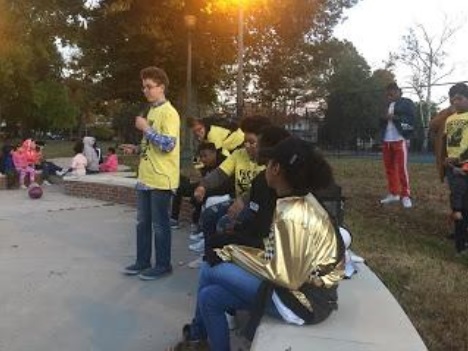 In the summer, it continued as the Teen Advocacy Group of Richmond, TAGRVA. It was a rocky rollercoaster, and not much of one at that, but eventually, through simply showing up again and again, it stabilized. We have five people in total, and it doesn’t seem like much, but it is. My point is anyone can go anywhere if they continue to show up for and with other people. “Anyone” in that sentence is the word I had forgotten about for so long, but then we had an idea. We decided we could expand TAG, so anyone could make their own. All they’d need is people, a time-frame, and a venue. Ours are: friends who live nearby, Wednesday evenings, and my house. It’s that simple, yet that important, to talk to other people with other backgrounds and ideas. If you are a teenager or know one who may be interested in forming a group, you can learn more at www.tagrva.com. My point here is that even something as simple as frequently brainstorming actions with friends, or attending an event, really matters — your first step is to show up. 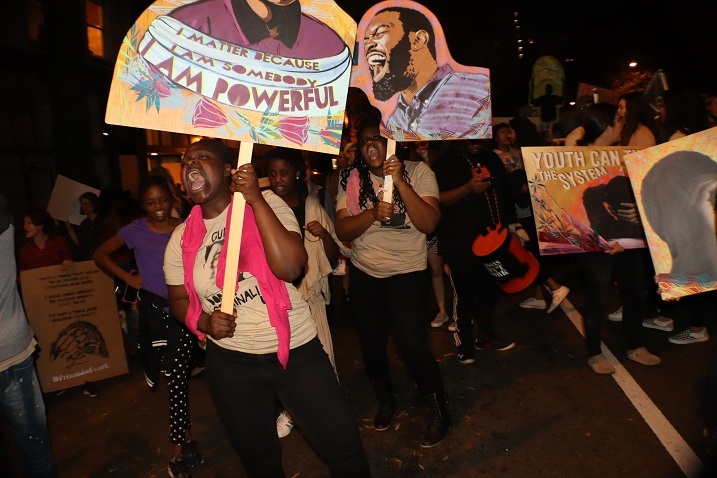 Over the weekend, local organizations Rise for Youth and Performing Statistics joined Art 180 to march in the 3rd Annual Juvenile Justice Parade. 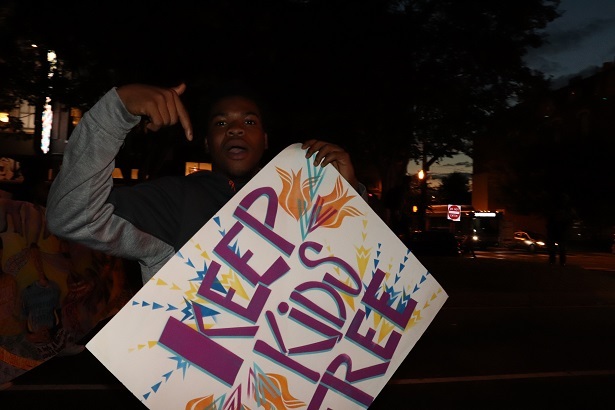 With the rallying point starting on Marshall Street across from the General District Court, over 100 participants gathered in support of those impacted by the school-to-prison pipeline. 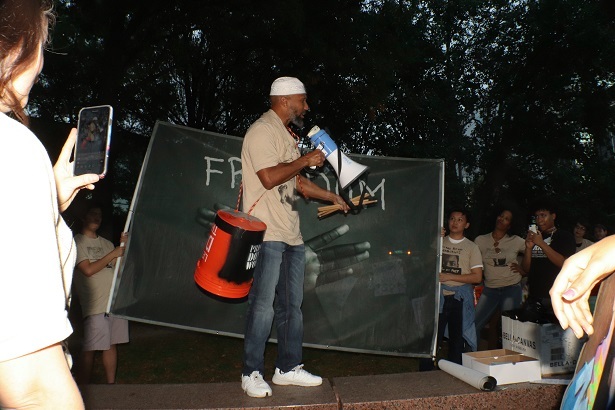 A few powerful community activists, as well as few formerly incarcerated teens, spoke to the masses before the parade commenced. 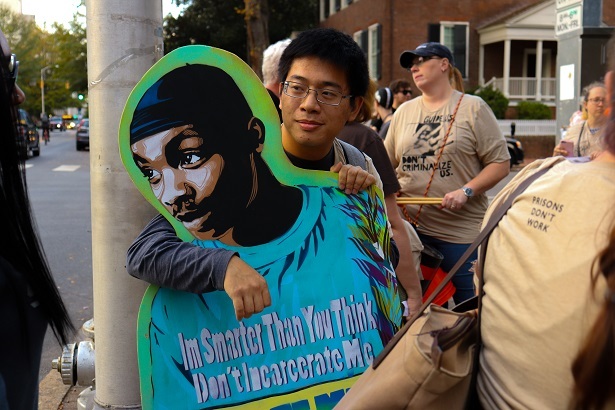 Parade participants included artists, community and faith leaders, teens formerly incarcerated and not, as well as local citizens. Making its way from the heart of downtown, the parade hopped on Broad Street and made its way to Belvidere before wrapping up in Abner Clay Park. 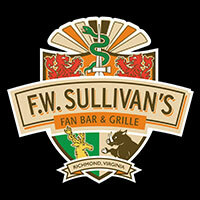 The lively and powerful event and the highlight of November’s First Fridays.